According to experts, our homes are much dirtier than we can imagine, but using too many commercial household cleaners that are full of chemicals which seriously endanger the health of our family is definitely not an option. On the other hand, tea tree oil is a natural, effective, and completely safe way to clean the home. It is a non-chemical essential oil derived from the Melaleuca alternifolia tree in Australia and has been used by the Aboriginals for thousands of years, as a natural medicine, and a powerful weapon against bacteria. In a 12-ounce spray bottle, pour 3-4 drops of the oil, 2 tablespoons of vinegar and 1 tablespoon of borax, fill it up with warm water, and shake. You will get a powerful and natural all-purpose cleaner. To clean and disinfect the dishes, add a few drops of it to the soap dispenser in the dishwasher before adding the soap. In a spray bottle, mix a teaspoon of tea tree oil and cup of water, shake, and spray all over the areas affected by mold. Leave for a few minutes, and wipe away. To prevent mold and mildew, simply spray to apply where needed. Add 6-8 drops of it to the laundry when washing the linens to disinfect them after an illness, and to disinfect the air, add it to the warm mist vaporizer. 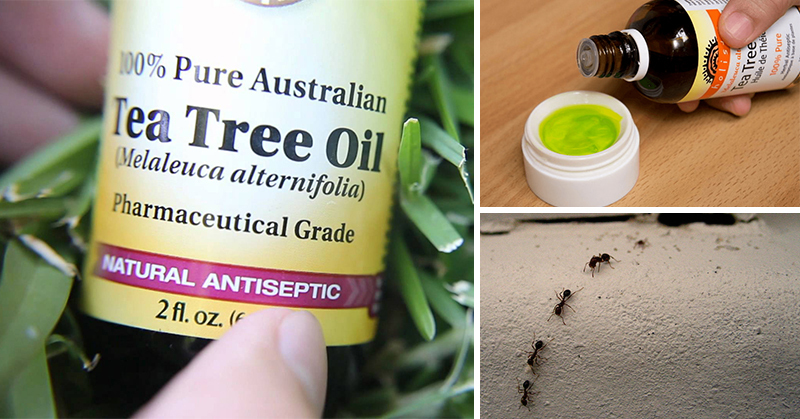 Pour a few drops of this amazing essential oil on the entrances of ants in the house, and this will keep them at bay. Also, to deter roaches, mix it with water, and wipe down the cupboards. To make your own homemade bathroom scrub that will clean mold and bacteria and eliminate stains, in a bottle with water, pour 10 to 15 drops of tea tree oil, vinegar, baking soda, and castile soap. To disinfect the laundry and leave a fresh smell, add several drops of tea tree oil to each load of laundry. To eliminate the bad smell that comes from the garbage bin, and prevent the growth of bacteria at the same time, pour 3 or 4 drops of tea tree oil into the bin before the bag goes in. Start using tea tree oil when cleaning your home, save your money, and avoid the side-effects of chemicals in store-bought cleaning products!